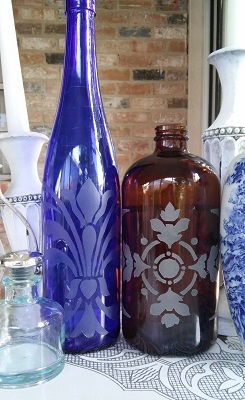 With spray painted glass etching stencils, you can transform old bottles, glasses, pitchers, vases…anything made of glass (or even clear plastic for that matter) into an artistic addition to your décor! Once you start looking around, you’ll be amazed at what can be used for this project. Pictured here are a blue wine bottle, an apothecary jar (purchased at a garage sale for $2) and an empty diffuser jar. Some other ideas you might try are hurricane lamp globes (great for Christmas with a candle inside), a bathroom window, a glass plate for hanging or even a used mayo jar. That’s just some of the many items for you to turn into useable art. But there is much for them to be useful. Besides just pretty what-nots they can be filled with flowers or crystals for decoration. Of course, they can be used for storage of anything from oils and perfumes to pasta or rice! It's so easy too! As the video above shows all you do is wrap your item with masking tape, secure the stencil (see free stencil below) and then with an X-acto knife cut the design through the masking tape and peel off. Then spray paint with a light frosting of sea glass spray paint. Don’t panic if you can’t find that. White satin spray paint works too. Just make sure you hold the can a little further back then normal and just lightly blast a light cover. No problem! Well, here is the free stencil for this project as promised! Of course, this is just one stencil pattern but you can use any design that suits your project. In fact, there are many free downloadable stencils right here on this site. This design is shown on the blue bottle in the photo above. It’s great for a wrap-around bottle of vase. More Glass Etching Stencil Ideas! 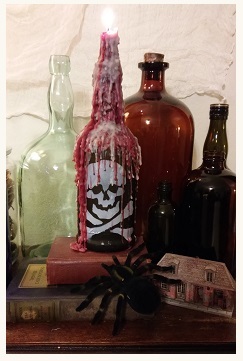 If you try this and like it, then you’ll love this scary Halloween Project so click over to Skull and Crossbones Stencil Bottle Candleholder! You don’t have to spend money to decorate especially for the holidays! You may be wondering about the other ways to etch glass with stencils and there are a few. If you have access to glass etching tools then you can view this process at Glass Etching Stencils! Also, there is such a thing as etching cream and that will be my next task to try so tune back in to see if I can master (or at least complete) that craft! 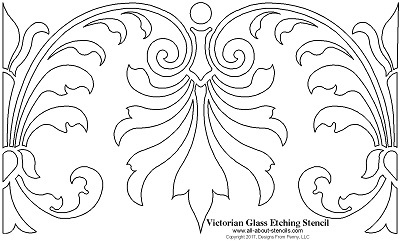 I hope you find Spray Painted Glass Etching Stencils interesting and easy! I enjoy trying new things and then sharing with you so come back often and as always please share your projects!